i came. i saw. i doorbusted. but sitting in my pj’s friday morning combing through the hundreds of ignored email ads, i found a not to pass up deal: a dressform. i reeeaaally needed a dressform and this price was just too good. full price, i’d feel like it’s something of a rip-off. half price… far more tempting. so, tired of trying to fit dresses without one, i finally splurged. yay for me! 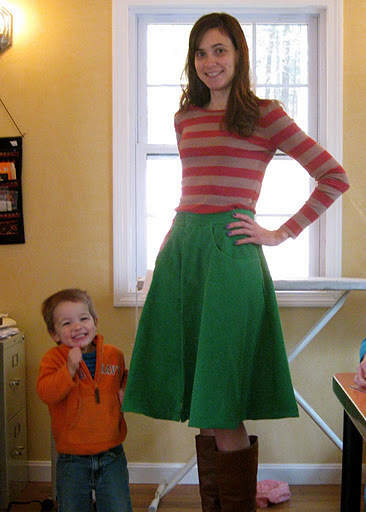 i finished the corduroy skirt last week and i’m moderately happy with the results! 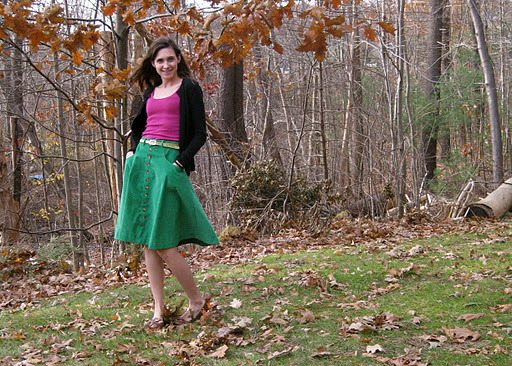 i started out with burdastyle’s linda skirt pattern. the pattern as printed is more of a 3/4 circle skirt. i tweaked the pattern down to a half circle and adjusted the waist and hemline to accommodate. i then added a placket for 12 buttons down the front, pockets and belt loops. sorry if the pictures aren’t great. she can’t hold still more more than half a millisecond. 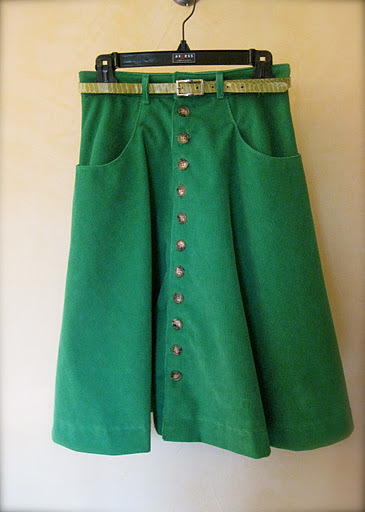 i do wonder if the corduroy is just too heavy for the shape of the skirt, it doesn’t seem to drape quite naturally. like i said, i made it a half circle skirt and thank goodness i didn’t attempt fuller!! i am considering cutting down the sides to more of an A-line shape. it may not be worth the extra work, though i think perhaps i would wear it more that way. in the future i’ll save the circle skirts for lighter weight materials for sure! maybe i’m wrong though… thoughts? comment below!! no worries, i don’t need to be told something is awesome all the time. it won’t crush my spirits. i’ve been working on this skirt. 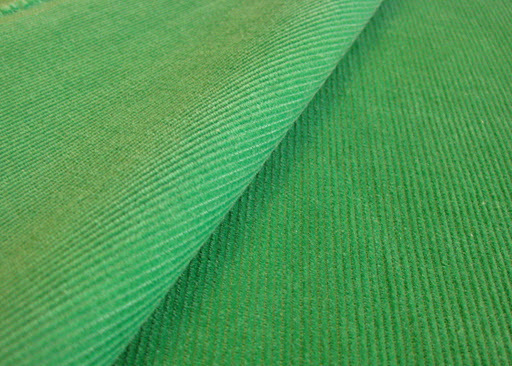 it’s a half circle skirt made out of green 14 wale corduroy. i will have buttons down the front and pockets. i’ve thought it would be useful to have a more “everyday but cute” item in my closet and thought this would be it for my fall wardrobe. so, what’s wrong? i really don’t know. i’ve attached the waistband and i held it up to me and was struck with how bland and plain it looks. here i was trying to do something i haven’t really done before, and that’s pick a solid color! something practical and cute that i could get lots of use out of but right now, it’s just looking… flat. maybe i’ve rushed to judgement. maybe attaching the buttons will pull it together. maybe i’ve always hid behind loud prints because i’m not confident enough to make something in a solid color. ack! plagued with self-doubt! okay, perhaps i exaggerate. maybe the world won’t end if i’m just not happy with the result. maybe i need to complete it before i judge. maybe i’m annoyed by other things in life and am misdirecting my disappointment and just wanted a moment of wow! i’m gonna love this!!! sigh. i’ll be back with more on this later. i’ve kinda been on a sewing binge lately. it started with the four halloween costumes (halloween, by the way was delayed for five days due to a ridiculous freak snow storm dropping 10″+ in our area and knocking out power for days!! 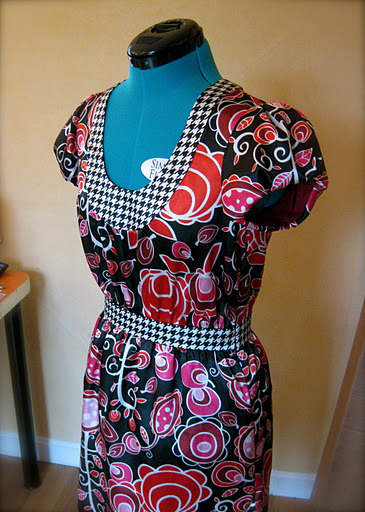 ), then i made a simple top for myself (sorbetto… what else? ), then i made a dress for my izzie bee’s 4th birthday, then i made a birthday gift for my big sister… all within about four weeks. hmmm… dare i say that i need a break from sewing? ha ha ha ha!!!! okay, just kidding there. 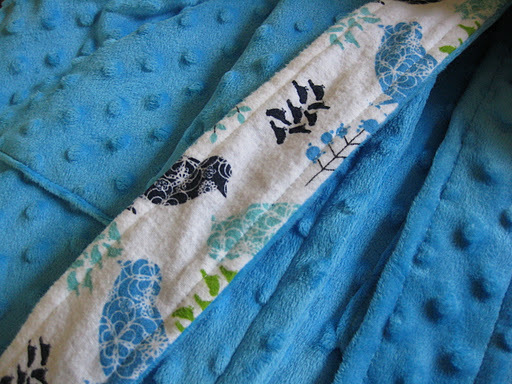 so i’ll start with the robe i made for my big sister, jessica for her birthday. i know, i know, a robe sounds awfully unglamorous. don’t worry, she’ll love it. she’s always cold! seriously! it’ll be the middle of summer and her fingernails and lips will be blue. i wish i got her ability to be cold all the time, i’m always burning up like a furnace. anywho… i’ve made robes for my kids over the years and they seem to be loved and admired by all. 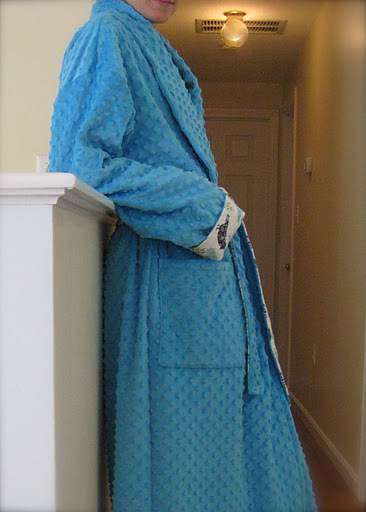 i always hear: “oooh, do they come in adult sizes too?” so here is my first run at an adult sized bumpy robe. yes, bumpy. 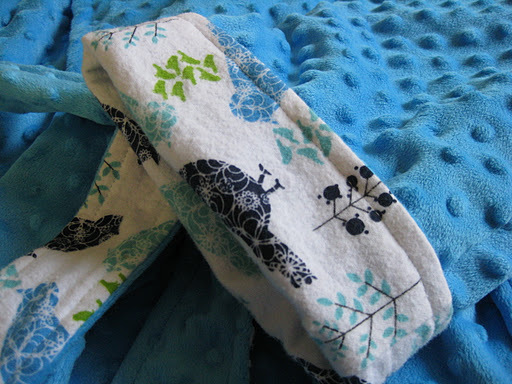 have you seen these minky fabrics? they’re super soft and the bumpy version is extra cuddly. 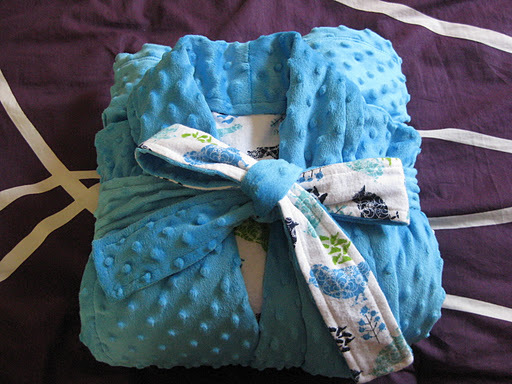 i line them in soft flannel and my kids tell me they are fabulously cozy! also, i recently acquired a serger as an early birthday gift (yaaayyy!!!!) 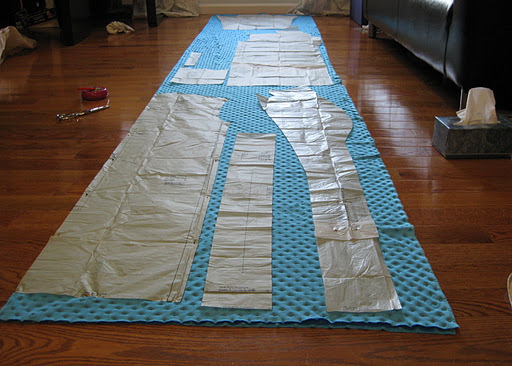 so i had a fast and easy way to finish all my seams! this was just the minky. the flannel was even longer! first off, minky is thick and it makes a mess when you cut it. 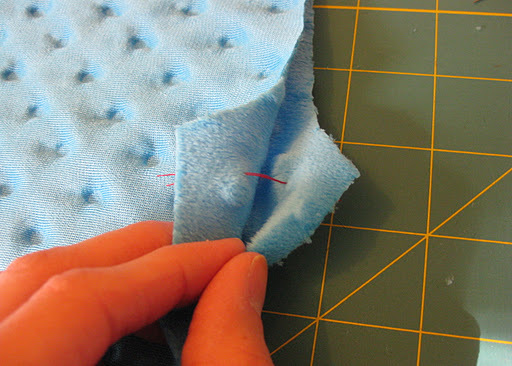 the flannel also creates a ton of lint in the sewing machine so it’s is super crucial to clean out your machine many times during a project using these types of fabrics. a can of spray air is extremely useful here. 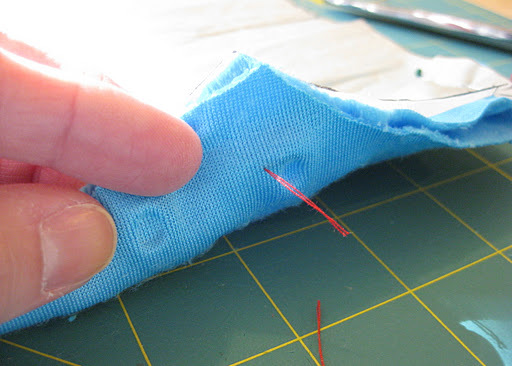 after your fabric is cut but while the pattern is still pinned to the fabric, take a hand sewing needle and thread it with a contrasting color that will be highly visible on the fabric. 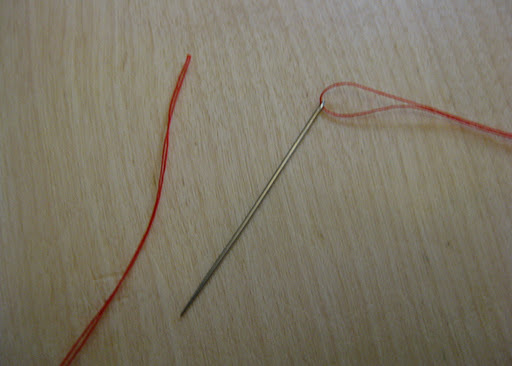 pull the needle all the way to the middle of the thread so you end up with a double strand. 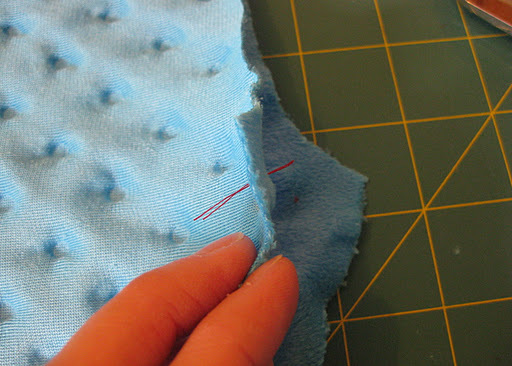 poke the needle through the marking all the way through the material and pull the needle to the other side. 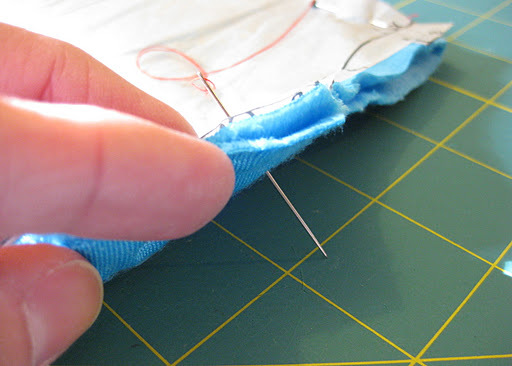 leave about an inch of thread on the top side of the material then cut the thread leaving about an inch hanging from the bottom side. do all the markings for the pattern piece like this. i’m not talented enough to edit it out of my pictures! 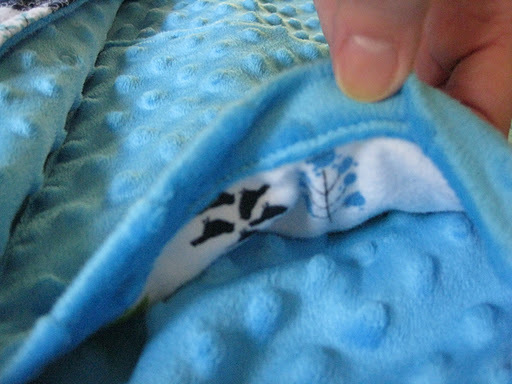 once they are all marked, unpin the pattern and remove it from the fabric. the thread should just fall through the tissue without any issue (hee hee… i rhyme all the time… too much dr. seuss perhaps?). then, carefully separate the two layers of fabric and snip the thread in the middle so that each piece has two threads sticking through it. 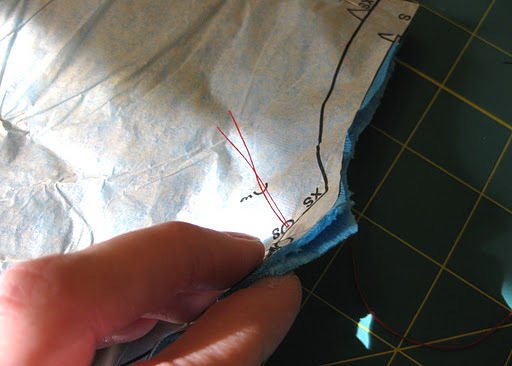 this is such a simple accurate way of marking, i rarely use any other method even on fabrics that take marking easily. 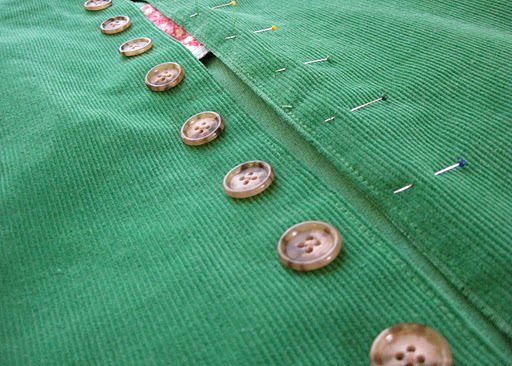 the tailor’s tacks show up on both sides of both pieces of fabric with minimum effort. try it once, you’ll be a convert. really the most difficult part to making an adult sized robe is the fabric cutting. after that, it sews up very quickly. faster if you aren’t lining it, of course. and here is the finished product! the facing was hand stitched to the lining allllll the way around. it took hours… and produced some serious hand cramping! the lining makes a nice contrasting touch at the cuff, the tie belt as well as the insides of the pockets.